Harry C. Triandis is professor emeritus of psychology at the University of Illinois at Urbana-Champaign. A pioneer in the study of cross-cultural psychology, Triandis’ research has focused on the cognitive aspects of attitudes, norms, roles, and values across cultures. His book, Fooling Ourselves: Self-Deception in Politics, Religion, and Terrorism, published in 2009, received the William James Award of Division 1 of the American Psychological Association. The book illustrates how self-deception profoundly affects everyday life across cultures worldwide, be it in politics, religion, or terrorism. Born in Greece in 1926, Triandis moved to Canada while in his early 20s. In 1951 he completed his bachelor’s degree in engineering at McGill University and in 1954 his master’s degree in commerce at the University of Toronto. He earned his PhD in 1958 from Cornell University in Ithaca, New York. The University of Athens, Greece, awarded him an honorary doctorate in 1987. 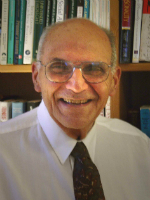 Triandis is the author of several books including Attitudes and Attitude Change (1971), which became a Citation Classic; Analysis of Subjective Culture (1972), which included extensive empirical work done in Greece, India, and Japan; Interpersonal Behavior (1977); Variations in Black and White Perceptions of the Social Environment (1976); Culture and Social Behavior (1994), and Individualism and Collectivism (1995). In addition, he was the general editor of the six-volume Handbook of Cross-Cultural Psychology, and co-editor of the Handbook of Industrial and Organizational Psychology, Volume 4 (1994). Triandis has served as president of several scientific societies including the International Association of Cross-Cultural Psychology (1976), the Interamerican Society of Psychology (1987-89), the International Association of Applied Psychology (1990-94), as well as Divisions 8 (1977) and 9 (1976) of the American Psychological Association. * The FABBS Foundation would like to thank Dr. Jack Feldman and Dr. Wendy Rogers for nominating Dr. Triandis for this honor and for leading the effort to spread the word about his nomination. Would you like to honor Dr. Triandis? It’s not too late to have your name added to the list of donors! You can make your donation to Dr. Triandis’s In Honor Of… campaign at anytime.